Running Paws are holding a ‘Run & Train’ day at the Celaeron Equestrian Centre on Saturday 24th March 2018 (view map here). Ceri, Mary and David will be setting 3 full courses for you to run – 2 agility and 1 jumping. After the first run of each course, the group will be given feedback and then a chance to re-run the course how you intended to the first time around. Hehe! You can also train in the ring, using the course time to practice whatever you like in a mock-competition environment. Toys and treats can be used if you are training in the ring. All funds raised will go towards supporting Ceri and Mary who are representing Team GB at IFCS 2018 in Italy. 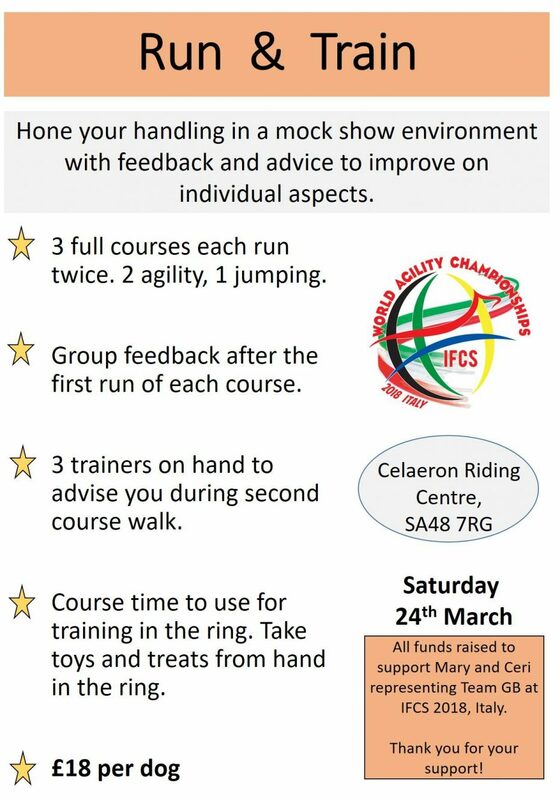 This is a great early season warm-up opportunity for agility competitors, particularly as the Easter shows are just around the corner! So, if you are interested, please contact us to book a place. The event is also open to non-members of our club.